Can you leave year off? BEST ANSWER: Hello Jeanette, we do offer custom personalization depending on what you were looking to have printed. Please reach out at 800-356-8466 and our sales department will be able to assist you with any custom personalization needs. Thank you! I wanted to submit date personal reasons. However, I imagine if you don't submit date there is nothing to input. does it say winery & bistro on the bottom after custom name and year ? 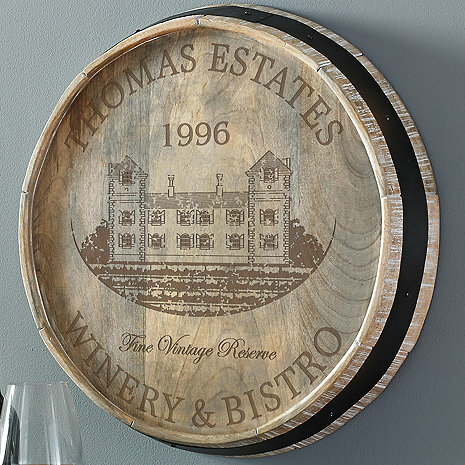 BEST ANSWER: The Personalized Winery & Bistro Quarter Barrel Head Sign does include the words "winery & bistro" imprinted on the lower part of the sign. There are two lines of personalization - line one is on the very top part of the sign and includes up to 14 characters and line two is up to four characters. Pictures do not do justice for this. Was very pleased. It’s a beautiful piece on our wall in our wine room. The sign was a great gift but the writing and graphics on it were very light. Also, the wood has a large flaw in the middle of it. It looked like a bird went to the bathroom on it. The recipient loved it but for the money I was disappointed.